Hello Ucreate readers, thanks so much for having me! 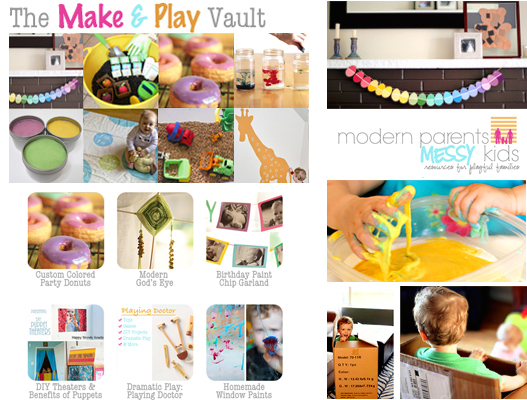 I’m Steph, founder/managing editor of Modern Parents Messy Kids and mom to a 2 year old son and 13 month old daughter. I started MPMK as a resource for helping parents to engage their kids, organize their life, and add a little style to their home. In my former life I was a Doctor of Audiology and worked with pediatric patients, now I spend my days racking my brain and scouring the internet for simple ways to connect with my kids. I gravitate towards anything that’s accessible to all parents (including the crafting-impaired), fosters development, and has a bit of a modern edge. 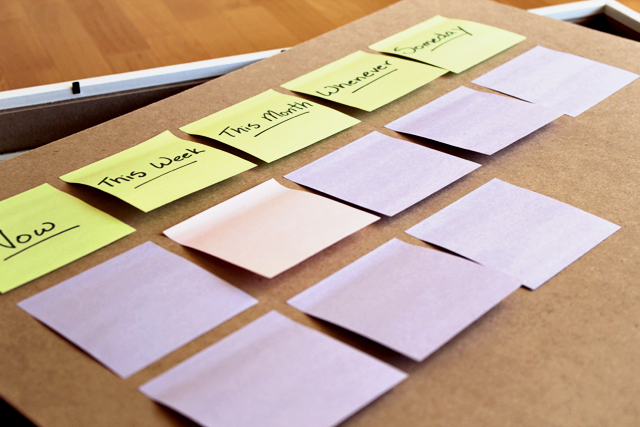 Today I’ve got a super simple project you can get done in 5 minutes flat. It’s nothing too fancy but you’ll use it everyday. Hang it in the kitchen or home office and I guarantee you’ll get more stuff done (not to mention a few compliments on your creativity). a stack of colorful sticky notes, a marker, and a shadow box. I got my shadow box from Ikea (it measures 19.5″ square) but, as I’m sure you all know, they can be found at any local craft store. 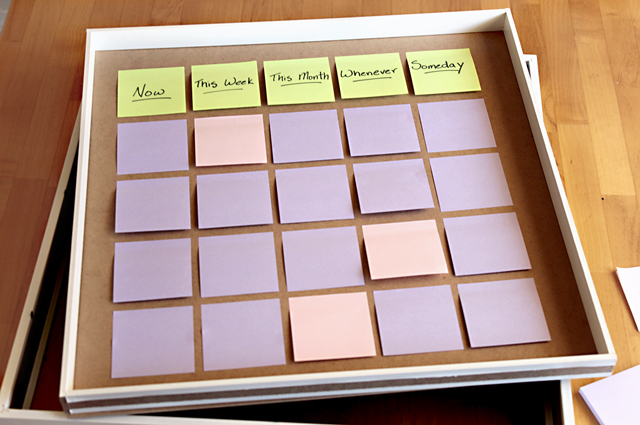 Next layout your sticky notes in a grid. I used the backing that came with the frame as my background but you could also go with some colored poster board. Also, I just eye-balled it… if the idea of that makes you a little twitchy, feel free to use a ruler for perfect spacing. Once you have the layout the way you like it, I would recommend using some glue to reinforce everything. That’s it (five minutes was probably and over-estimate). Just hang it on the wall and feel the weight being lifted off your shoulders as you instantly morph into a more organized, and all-around better, person. Also, don’t forget to store a small dry erase marker on top for easy access. Thanks again to Kari for having me! I hope you’ll all take a moment to stop by MPMK to say hi! I love a smart, uncomplicated idea. Great work Steph. This is awesome. Steph, this ROCKS! I love the post its, I love the “green.” Freakin’ awesome. Thanks so much everyone!! And a big thanks to Kari for having me!! Thank you! I’m going to do this. Ikea, here I come. Great idea for a family calendar. In preparation for back to school, I have been in organization-craze mode! Just last week, I created this central command center: http://www.sasinteriors.net/2011/08/my-new-central-command-center/ and then made this personalized dry erase calendar: http://www.sasinteriors.net/2011/08/diy-personalized-dry-erase-calendar/. I’m going to share your calendar on my facebook page: http://www.facebook.com/sasinteriors. Thanks so much for your wonderful idea. I hope you don’t mind but I featured you Steph, as well as U-Create on my blog! 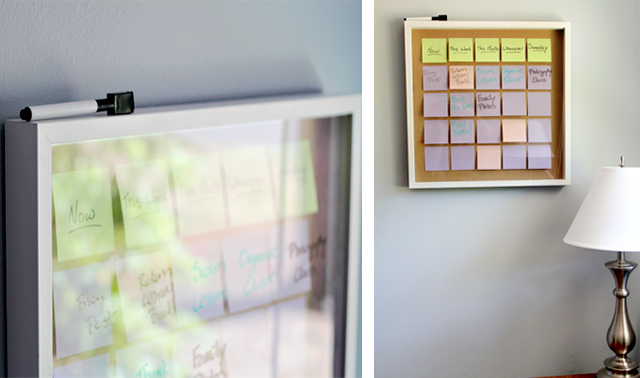 I can’t wait to do this to-do list…I need one to remind me to actually do it!! That is the most clever thing I have ever seen and I can’t wait to try it!!! At first I thought, what a waste of sticky notes but then when you said you just use dry erase marker, needless to say genius!!! Thanks for the idea!! This is so clever! I can’t wait to try it. 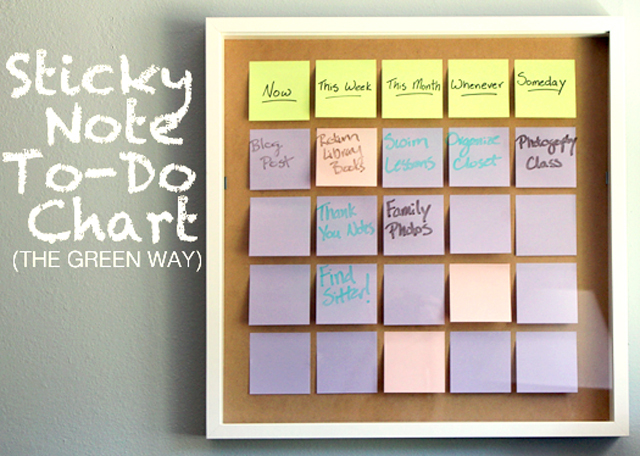 great idea….might use this as a “TO DO” list for the family….then kids/hubby just have to look at their list! I love that idea<3 It’s simple and stylish as well! I will get the resources I find around home. Thanks for sharing!